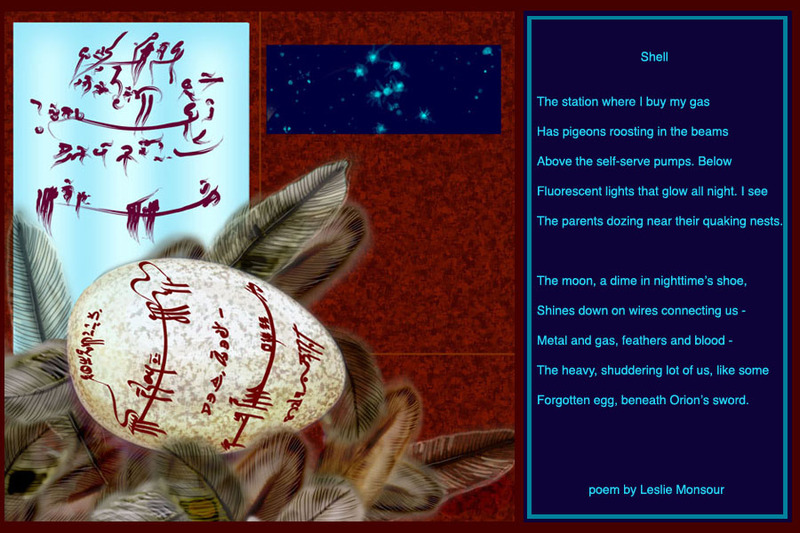 I have translated this poem by Leslie Monsour into Tapissary. It comes from her book, The Alarming Beauty of the Sky, and she was very gracious in allowing me to use it. As her work gives me the pleasure of traveling alongside the many levels of her imagery, it was difficult to decide which poem to single out. So many of them are my "favorites." ,Click the play arrow on the console bar to hear SHELL read in Tapissary. The poem is transcribed into Tapissary's Latin-based phonetic alphabet below. Note: I'm currently having problems with the sound files. Hopefully this will be corrected by July 15. Ze miteriµ prosh jdu cucucuad talystitiµ nead. Shtomacnou tamax nalash Orioñshé ctanañ. This free verse poem is part of a work I wrote for an illustrated panel. It was displayed in the exhibit "Hieroglyphic Collages" in 2008. I read the three lines out loud, in Tapissary. The film duration is 51 seconds. Nuvwa jot kakacr, aroma ze hana séduihi, ydrou ri tiçélosh' ërgëyi. Unseen though bold, aroma seduces the nose in the breeze's flattery. tis shiñoa oubiñ jdi vopaj na suédañs. with scent as its speech and assurance.